Nothing gets me into better shape than running. (My body always thins out when I run a lot … which I haven’t experienced in years but I know it works unlike anything else ;)). Nothing costs less than running. (All you need is sneakers and workout clothes). And n0thing is as mind-clearing as running. (Hello — fresh air, hard pavement, sights all around — I’m possibly the only freak who does not run with an iPod). I also loved that when I ran up the driveway, Maya was outside with Luis, Rocco and Ben, getting ready for our walk — so she saw me actually running up our street. While she knows I go to Zumba a couple times a week, I don’t think she’s ever actively seen me exercise (besides our walks)– and I think it’s really important for my kids to see how fitness is a part of our lives. It sets a good example. My love-hate relationship with running has ebbed and flowed over the years. Sometimes I have felt compelled to run daily. Other times, months pass in between my runs. Of course, I think this is partially because I ODed on running in high school and college (if that’s possible). I used to run nearly every day in high school. We had to run in gym class three times a week; we had to run 1.5 miles before cheerleading practice (for conditioning) five days a week; and I ran track … so pretty much I was assured to run at some point on any given day … and often more than once. Then in college, it was my breakaway time … most afternoons you could find me running in the gorgeous, tree-lined, diplomat-residing neighborhoods behind American University in Washington, D.C. Running was a source of salvation — and carried me through the most painful breakup of my life. Now, 14 years later, life is very different and I don’t have the luxury of running on a whim … BUT, I’d like to make time for it. To build it into my day. If nothing else, a couple times a week. I am not one to train for races or anything like that (though I have lots of friends who do — props!) 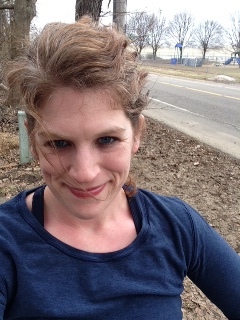 – but a little recreational running does the mind, body and spirit good, and it’s time to do something for me … part of the challenge of being a mom is putting yourself first, but sometimes we do need to put our own oxygen masks on first.